In Birmingham, one of the most common pests which can make your living conditions hell is the bird. They are noisy and carry diseases. Give our pest control Birmingham team a call if you have a problem with birds. All our work is carried out in the West Midlands area including:- Solihull, Hall Green, Sutton Coldfield, Four Oaks, Handsworth Wood, Perry Barr, Shard End, Yardley, Acocks Green, Edgbaston. Birds are a nuisance creating problems with noise, bird mess, getting in roof spaces and in some cases aggressive behaviour. Some birds are protected under the Countryside and Wildlife act 1981 so to deal with any bird control problem a General Licence is required. Stop That Pest UK Birmingham are fully qualified and licensed to deal with any bird problem. Their nests can be the source of many unpleasant insects: Blood-feeding insects like fleas, mites, bugs, ticks and lice, Fabric-damaging insects including carpet beetles and clothes moths, Stored food pests like spider / domestic beetles and book lice, Carrion-feeding insects such as house flies and blow flies. 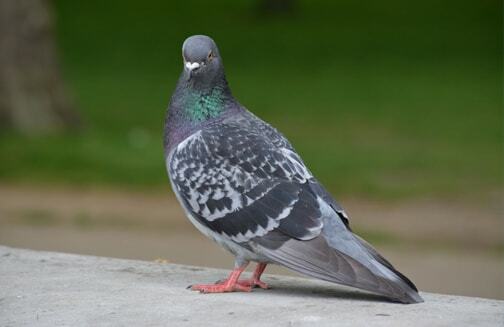 The most common birds in the UK which cause a nuisance are Pigeons, Seagulls, Rooks, Canadian Geese and Starling. Why Proof? 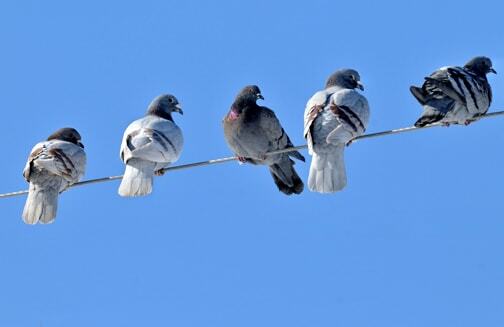 Health Urban pest birds pose a considerable threat to human health due to the number of diseases and bacteria that are present in their droppings and nests. The diseases relating to pest birds are: Ornithosis Ornithosis is a 'flu-like disease most commonly found in pigeon droppings. Fatalities are rare, but occur as with any other influenza virus. However a more serious form, called psittacosis can also be present in their droppings - the symptoms of this are more like common pneumonia. Allergic Alveolitis More commonly known as 'Pigeon Fancier's Lung' this is a serious allergic reaction. The only be cured by the removal of the birds and their nests. Allergic Alveolitis can result in permanent lung damage. Histoplasmosis The spores of this fungus thrives in bird droppings and can affect humans who breathe them in. This particularly becomes an issue when birds are nesting on air intakes and spores can be spread throughout the building. Salmonella Salmonella is present in most pest birds, but features in a high percentage of feral Pigeons and also Starlings. Birds have been known to contaminate water sources so should be considered a health risk at food premises. Escherichia Coli Gulls in particular have been linked with the spread of E. Coli because they scavenge for food on rubbish tips, sewage treatment works and sewage outfall pipes. The E. Coli organisms are present in the gulls droppings and can spread to water supplies and any food premises. Bird nests can also contain other insect pests such as carpet beetles, clothes moths, spider beetles, dermestid beetles and booklice. Dead birds can lead to infestations of house flies and blowflies. Please note - due to the health risks associated with the removal of bird nests and droppings, only trained and suitably equipped personnel should perform the task. Safety Wet bird droppings are very slippery and could be dangerous where the public has access. The problem is even more significant if the droppings are on emergency stairways or fire escapes.